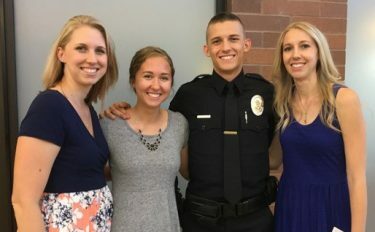 Bill and Jenny Knotts and their four children are tied to Grand Canyon University in so many ways, the family tree is purple and the branches reach all across the community. First, their oldest daughter, Brittany, went to GCU. She was followed by younger sister Andrea. Then brother Trevor. Then the baby in the family, Chelsea. Four for four. Three graduates, one current student. Once the others saw the experiences Brittany was having at GCU, the path from their former home in nearby Chandler, Ariz., was clear. Bill and Jenny Knotts’ four children — (from left) Andrea, Chelsea, Trevor and Brittany — all are Lopes. Brittany arrived on campus in 2003 and was one of the first students to live in Hegel (now Cypress) Hall. She got her education degree and now teaches second grade, and she gave birth to her third child in January. Andrea was in the nursing program and now is a paramedic in the emergency room at Phoenix Children’s Hospital. Trevor got a business degree from GCU and was a highly visible figure on campus – he was vice president of the Havocs and also was Thunder for three years. But now he’s in a much more serious role: He’s a Phoenix police officer. His wife, Rachael, also is a GCU grad. Chelsea could have gone to another college, but her memories of family picnics on the grass where GCU Arena now stands were too vivid. She’s a junior majoring in nursing, just like Andrea. And Trevor also noted that GCU’s spirit of community outreach had a noticeable effect on all four kids: They all want to help in the community. “GCU taught us to love Phoenix,” he said. Her 6½-year-old son, Ryan, already has his college picked out.